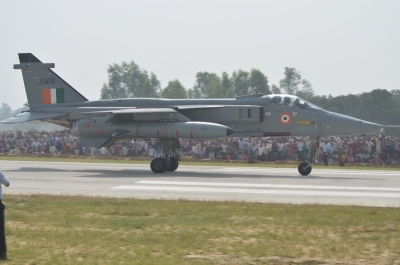 Lucknow, Oct 24 (IANS) Sukhois, Jaguars and Mirages of the IAF did a touch down and take off drill on a four-km stretch of the Agra-Lucknow Expressway in Unnao district of Uttar Pradesh on Tuesday as hundreds of thousands of people lined up to watch the thrilling spectacle. While more than a dozen of the 16 planes that landed were fighter planes, the remaining were carriers. The four-km stretch had been strengthened during construction for the purpose, an official informed IANS. In November last year, a similar drill involving eight fighter planes had been conducted a few days before the inauguration of the 302-km Expressway by the then Chief Minister Akhilesh Yadav. A special US plane C-130 was also involved in Tuesday’s drill, officials informed. The two-hour drill, officials said, was to train the Indian Air Force (IAF) fighters and personnel to deal with emergency situations like an aerial attack or destruction of a base, which would require immediate touch down and take off from other places to retaliate, an informed source clarified. The Agra-Lucknow Expressway has been thrown out of bounds for vehicular traffic for the past few days in view of the drill.